The Cook Political Report has made five ratings changes in their 2018 Senate forecast. Four races have moved to toss-up, including Indiana, Missouri, Nevada and West Virginia. Of those, only Nevada currently has a Republican incumbent. 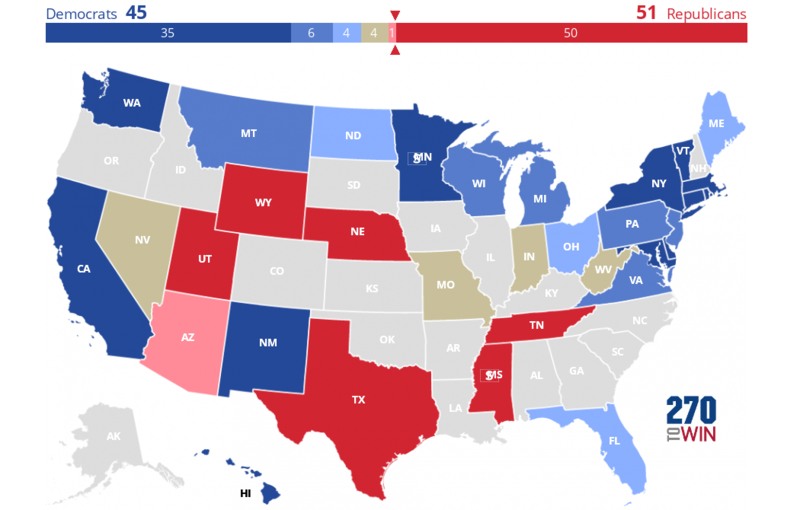 Republicans currently have 52 Senate seats, to 48 for the Democrats. The Democratic number includes two independents that caucus with that party. Given the current political climate, it would seem that the party should be well-positioned to gain seats and control in the 2018 midterms. However, as we've noted before, that is unlikely to happen. Only 9 of the 34 seats to be contested - including this year's Alabama special election - are held by Republicans. Of those, only two, Arizona and Nevada, are likely to be competitive. That means even if Democrats hold all 25 of their seats -- many of which are competitive -- and win those two Republican seats, they still only get to 50 seats. In that scenario, Vice-President Mike Pence would break the tie vote, and Republicans would retain control.